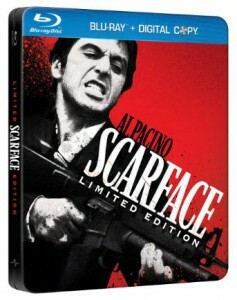 Scarface, the classic Brian De Palma film that stars Al Pacino as gangster Tony Montana will be released on hi-def Blu-ray Disc September 6, 2011. The special limited edition disc from Universal will be packaged in a collectible SteelBook case, and come with ten exclusive art cards, a digital copy of the film, and DVD of the original 1932 Scarface. Special features on the Scarface limited edition Blu-ray include documentaries, deleted scenes, featurettes, U-Control, BD-Live, and pocket BLU app functions. The BD itself is formatted in 2.35:1 widescreen aspect ratio with 7.1 channel DTS-HD Master Audio. Total run time is 2 hours and 50 minutes. Are you diehard enough for this? A Scarface-themed cigar humidor will also be available in limited quantities (1,000 worldwide), which is made of untreated Spanish cedar and will hold up to 100 cigars. Along with the Special Limited Edition release Universal is running a promotion for fans to design artwork based on Scarface. The top 10 cards chosen out of the Top 25 will be included as the exclusive art cards mentioned above. “Nearly 30 years after it first exploded onto the screen, Scarface stands as a cultural icon with a passionate and growing fan base that continues to exert an enduring influence on not just moviemakers but artists across the entire pop-culture landscape,” said Craig Kornblau, President of Universal Studios Home Entertainment. Order Scarface from Amazon.com and watch the Amazon Instant Video rental on your PC, Mac, compatible TV or compatible device at no extra charge.